Well and truly in the thick of it now. I think. Although am now thinking things will definitely get more intense so am probably not in the thick of it yet at all... Ah man. Week one was fairly deer-in-the-headlights (eager and enthusiastic deer, but deer gaping at an oncoming truck nonetheless) whereas week two feels more like deer-who-just-got-hit-by-a-truck-and-is-shocked-to-find-self-relatively-unscathed. Weird analogy. Apologies. 'Tis uber late. I had a job interview yesterday, which was the first thing I applied to while on the course. Didn't expect to get an interview so quickly. Pray for me, people of the internet. Advice for future peeps: befriend. We formed fast friendships and it really does make the whole clawing-at-own-brain-to-meet-deadlines process much more fun. (In a sadistic let's watch each other get hit by a truck and clean up the mess kind of way.) 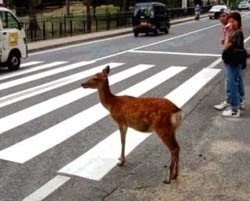 That sounds kinda dark, it's not meant to be dark... just go back to the happy little deer.